December 16, 2015 (New York, NY) – Garis & Hahn is pleased to present Color Field Studies I, IIand III by Joe Nanashe, a three-channel video installation presented on continuous loop fromDecember 20, 2015 through January 10, 2016. This exhibition is part of the Winter Windows program, a semi-annual series of artist- and curator-led projects shown in the gallery’s windows during its seasonal closures. This is Nanashe’s third exhibition with Garis & Hahn and features his never-before-seen Color Field Studies. Joe Nanashe’s Color Field Studies I, II and III uniquely combine minimalism, performance and video art. Presented on three, continuously running monitors, Nanashe is seen repeatedly applying various colors of paint to a wall, darting in and out of the frame as the color of the surface shifts dramatically from white, yellow, red, blue, black and back again. 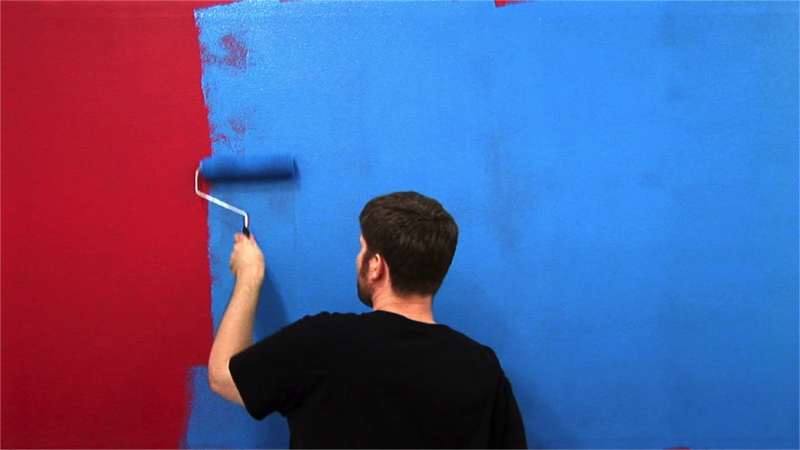 Speeding up the video enables the viewer to witness the subtle color shifts that happen as the paint dries, going from light to dark, from glossy wet to matte dry. Nanashe’s Color Field Studies are influenced by the performance video works of the 1970s and adapted for the attention span of a 21st Century audience. Nanashe’s Color Field Studies blends performance, video, and installation into works that confront the viewer with issues of perception and the human body. The repetitive, task-driven nature of Nanashe’s work is influenced by modern society’s post-industrial landscape and emphasis on manual labor. Using video as the medium for performance art, these works act as both documentation and a version of manipulated output that cannot exist in reality. Taking cues from art history, the work pushes the idea of video-based performance further by adding a playful twist on “watching paint dry”. Winter Windows extends Garis & Hahn’s program emphasizing artist- and curator-led projects that further public engagement. This will be the second edition of Winter Windows. Shown in the gallery’s windows during its December/January break, past presentations have proved a popular and unexpected opportunity for art viewing. Summer Windows is a continuation of this series during the gallery’s summer closure. Joe Nanashe was born in Akron, Ohio, and studied sculpture at the University of Akron. In 2003, Nanashe continued his education at Rutgers University. He received his MFA and the Paul Robeson Emerging Artist Award in 2005. His videos have shown in multiple editions of the New York, Chicago and Lausanne Underground Film Festivals. Recent exhibitions include Garis and Hahn Gallery, Birnam Wood Galleries, Jim Kempner Fine Art in New York City. He also exhibited Parrish Art Museum in Watermill, Islip Art Museum, Eric Firestone Gallery, and QF Gallery in East Hampton. He has exhibited internationally in Switzerland, Germany, Netherlands, Russia, Japan, Canada, and Argentina. He is represented by Victori + Mo Gallery, New York. Joe lives and works in Ridgewood, NY.